SEOUL, Feb. 14 (Yonhap) -- South Korea said Thursday it will mandate operators of oil storage tanks to install fire detectors near their facilities by June next year in a move to boost safety measures. The devices would detect sparks near oil storage tanks that could be vulnerable to fire and explosion, according to the National Fire Agency. The Korea National Oil Corp., a state-run energy firm, has 106 oil storage tanks, while the Daehan Oil Pipeline Corp. and refiners have 134 oil tanks and 156 oil storage facilities, respectively. 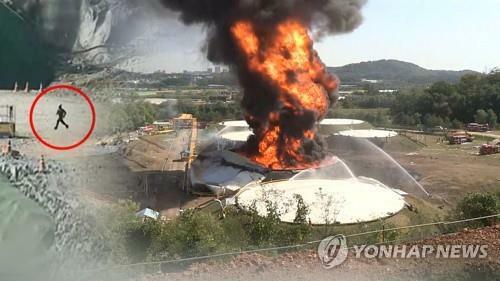 The move came four months after a fire and explosion tore through Daehan Oil Pipeline's gasoline storage tanks in Goyang, a city just northwest of Seoul. Police believe a lantern may have started the fire when it fell on the lawn of the oil storage facility, causing flames that later spread into the ventilation system of the oil tank and created the eventual explosion. Daehan, a former state-run company that was privatized in 2001, built and operates 1,081 kilometers of pipeline network across the country. Currently, SK Innovation Co., South Korea's largest refiner by sales, owns a 41 percent stake in the oil pipeline company.